Classical music might be the least self-confident of all the arts, the one who reaches out with a fumbling need for reassurance to the first youngish, poppish collaborators its sees, too eager for their youthful charm to know whether they're good for them or not. That's how you end up with the middlebrow mess of 'events' like 'Luminous' where the Australian Chamber Orchestra plays REM beneath the titillatingly controversial images of Bill Henson. Like your mother wearing a crop top and a belly button stud it's not always a pretty sight . The State theatre is Sydney's most beautiful and it gives both a grand and intimate setting for the ACO, hung over them is a large screen onto which is projected images from the photographs of Bill Henson. The show starts ominously, both intentionally and unintentionally. If you've been to anything in a theatre or gallery that has pretensions to that type of dark arthouse seriousness you will be familiar with the atonal sub-bass rumble that is a standard signifier of post-industrial angst... or something. The rumbles are apparently provided by a 'sound sculptor' and are the kind of clumsy signaling of tone that much of the music really doesn't deserve. The first half of Luminous has lights both high and low. The ACO accompany the singer Katie Noonan, whose operatic vocals work beautifully with Britten's 'Corpus Christi Carol' but the final song sounded like an Enya song ripe for use in a hair conditioner commerical, it was very bad indeed. So keen are the ACO to trowel on novelty that the audience sat through a piece for cello and water, where the orchestra took to playing wine glasses with their bows. Both physically excruciating and hilarious, especially if one has seen 'Broadway Danny Rose', the interval came as a high pitched relief and the compulsory did little to mask scattered groans. Musically the second half improved vastly. The performance of Petris Vask's violin concerto "Different Light" should remind us all that subtlety, depth and beauty will create don't need to force themselves into trendy clothes. The power of the piece together with the precision of the playing and the power of the setting (the State, acoustics aside, does make us feel we're watching and hearing something special). I was moved beyond my limited classical music critical lexicon. The second half of the program is defiantly good, and overcomes the cringiness of the pop collaboration. However the music isn't the biggest barrier. 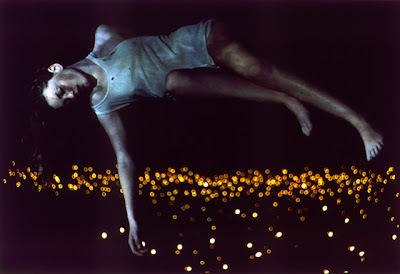 I have written about my response to the work of Bill Henson before, I find the combination of dark melodramatic lighting and taboo sexuality the worst type of High Art Lite, he flatters viewers into feeling edgy and art literate (yes, we know Vermeer loved skin and Caravaggio liked a shadow). What struck me about the work projected above the orchestra was how very few favours it does Henson. If comedy is tragedy plus time (or perhaps timing) the prolonged and repeated zooming and panning across Henson's work only helps to make his sullen and ever so serious craft appear funnily monotonous. In galleries or print we are less conscious of the sheer repetition, of how breathless bruised lip and open mouthed pouts are just as subject to the law of diminishing returns as any other artistic device. Shown so that a face might be perhaps twenty feet across, the grain of the film exposed, it's clear how artful Henson is in showing the supposed artlessness of his subjects. There is dirt beneath every fingernail, skin aspires to that oily Roman smear and you quickly feel you're watching an art director rather than an artist. As a part of the package of 'Luminous' the pictures are annoying in the first half and distracting in the second, where the music deserves the prominence. The roaming of the rostrum camera over them really does little other than underline clichés, in fact if you were to look at the photo album application 'iPhoto' you would see that there is a facility called the 'Ken Burn's Effect' (sic) that creates similarly restless moving pictures from your own snapshots. There is little sense of either unity or counterpoint between the various elements of Luminous, unless you count a confluence of smugness, and that does no-one much good. The chiaroscuro and electronic groans serve to remind us how often Art Lite is dressed up as Art Dark and how what was served up in Luminous felt very light indeed.